Most Americans would be shocked to discover that slavery still exists in the United States. Yet most of us buy goods made by people who aren’t paid for their labor–people who are trapped financially, and often physically. 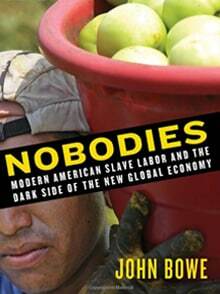 In Nobodies, award-winning journalist John Bowe exposes the outsourcing, corporate chicanery, immigration fraud, and sleights of hand that allow forced labor to continue in the United States while the rest of us notice nothing but the everyday low price at the checkout counter. Based on thorough and often dangerous research, exclusive interviews, and eyewitness accounts, Nobodies takes you inside three illegal workplaces where employees are virtually or literally enslaved.confiscated and to find themselves confined to a factory building. Pickle laid off Americans and paid the Indians three dollars an hour.